Since I was a child, music has always been a large part of my life. Not just when I’d party in my teens and early twenties but we’ll before as well. The lyrics to this song still resonate strong with me. Simply reading the words you can probably see why. As I lay in the hospital room after the surgery and the shingles started to clear away I remember talking with my dad about my girlfriend at the time. I was telling him how strong she’d been through all of this. I was telling him how once all this calmed down I would ask her to marry me…..this did not come to pass. I would listen to this song and replay these words in my head “And it’s alright to get caught stealing back what you’ve lost”. I mentally pumped myself up to conquer the world!! Until I had to attempt to stand up anyway. 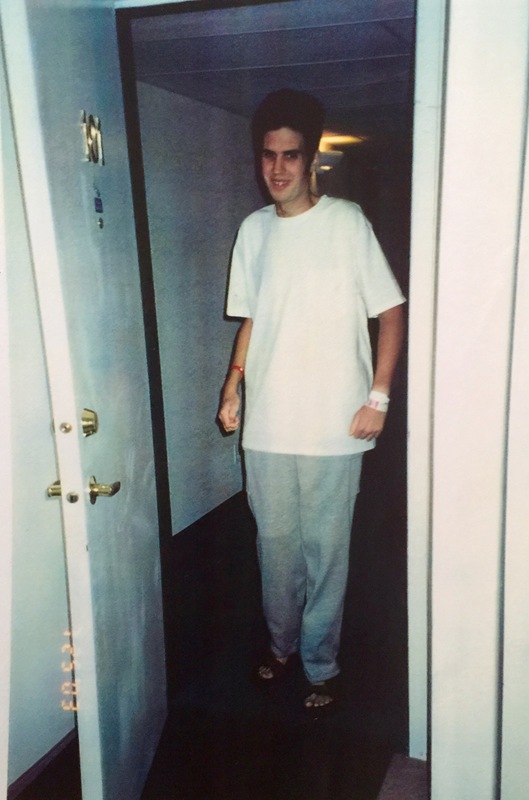 I was 21yrs old, 108lbs at 6’1″ tall. I knew I had a long road ahead of me. The day I was released, there was a movie like round of applause from the ward. At the time I secretly knew why the nursing staff was so happy. What I hadn’t mentioned to my family or my girlfriend was a private conversation the Doctor had with me a few days after my quarantine was over. He’d come into my room as part of the morning rounds before visiting hours. After he did his usual questions and check of my night chart he pulled a chair up close to me. He went on to say I was very lucky. The portion he’d removed had literally broken apart in his hands as he lifted it out of my abdomen. He paused and said, if it had burst inside the toxins plus the state my body was in he knew there would have been a strong likelihood that my body would not be able to win the battle. Once I arrived back home to the one bedroom apartment we shared, life and my new reality set in. There was a complete change in how I lived my life. I had lost so much weight, had an ostomy and the emotional stress of all I had experienced. It was recommended to me to name my ostomy so that if I was out with friends or family I could excuse myself if I had a leak of the pouch and use the name as the person who called. It didn’t take me long to name it “Charlie”. Being it’s a little chocolate factory! For weeks after getting home I had an ET Nurse come into the apartment to assist with the appliance changes for Charlie. When I was alone in the apartment I had a lot of time to mentality process what I had just experienced. One situation, out of many, keeps coming to mind even today. During my tenure at the hospital there was a lot of construction around me as they were expanding the hospital. When I was first admitted I was on unit 23… Which oddly enough was right next to the ward I was born on 21 years earlier. As the construction continued the began to close parts of Unit 23. Due to space constraints and the level of care I required the moved me to Pediatrics. To keep moving, obviously before the surgery, I would often walk the ward. I continued to do this in Peds. I would glance into rooms and see first hand where the kids parents would “live”. Even with everything I was going through I was frustrated and saddened to see these sick kids. As the hospital was fairly full I shared this room with a boy about 7-10 years old. He would do his best to comfort me when I was in pain. I never did find out why he was in the hospital nor did I ever meet his family. He would always tell me his mom worked a lot and his dad lived far away. Because he had been in the hospital for so long his mom would come out once a month or so and same with his dad. He would often draw me pictures or try to play games with me. He was a constant reminder that I was lucky, I had people in everyday to see me. If they were unable to come in I’d get the phone calls. He had no one. That continues to humble me whenever I get down on myself. I never did find out what happened to him, I just hope he survived all he was going through.